vooPlayer is a video marketing suite designed to allow users to fully-customize, analyze and add superpowers to any video, hosted anywhere including on YouTube, Vimeo, Dropbox, AmazonS3 or even host it on personal servers. "Helps You Brand And Market Your Videos In a Major Way"
I get the benefit of uploading my videos to Youtube for the marketing benefits but can also use the same video from Youtube on my website with custom branding, player controls and marketing messages that fit my business. Vooplayer lets you use 3rd party hosted videos like Youtube or Vimeo. You can also upload and host your videos with them but their storage limits are pretty small for heavy video marketers. If video is part of your marketing strategy then Vooplayer will save you a lot of time by using a single video platform and offers lots of branding and marketing options for your videos. Instead of having to upload my videos to multiple platforms, I can just use Youtube now and use Vooplayer to properly brand the player on my site without having to use the standard Youtube options. "New to VooPlayer, so far so good"
I don't like that you can't edit videos on the platform, so I have to create the video on another platform download it and then upload it to vooplayer. Video hosting, I was having a hard time with uploading my videos to different platforms but with vooplayer I can upload and share the link to my videos across all social medias. "vooPlayer recommended for all your video player needs"
There are so many features, but what I really like is the ability to stream videos from AmazonS3. It give me some comfort knowing I can keep control of my videos. The other thing I really, like is the video branching feature which allows me to segment my video based on what the view is mos interested in. There isn't too much to dislike, I switched from easy video suite which was great for a few years, but they never updated it. If you are looking for to host you videos for a membership site or somewhere other than YouTube that give you complete control. I highly recommend you consider vooPlayer. In addition there are a number of marketing features that give you the ability to have opt-in forms on your videos. This give you the ability to grow your list. There are other video hosting services that do the same but not at this price. This is my opinion is the best video player hands down. I'm saving money over other video players on the market and have more features. 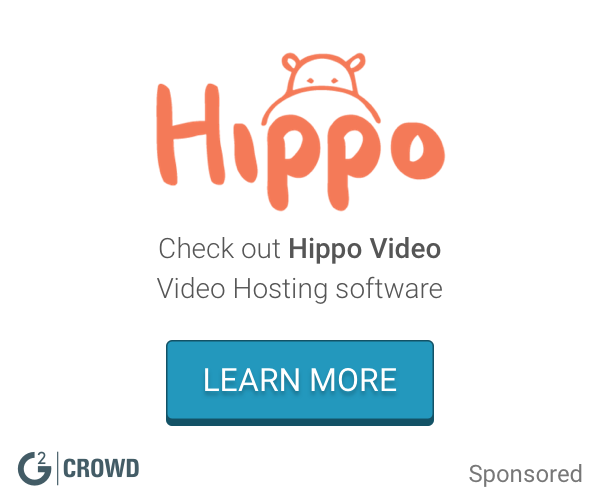 "Great video player, both for embedded and self-hosted videos." I love the A/B testing feature, which allows determining when is the best time to show an opt-in box to capture leads (or use any other CTA buttons), as well as the ability to migrate data from Youtube or Wistia. I felt like the learning curve was a bit steep, but it's a feature-rich tool, so I guess that's expected. The free plan has only 1 GB of storage, although it should be enough to give you an idea of what the tool can do. However, using it on a 4K video is quite unlikely. Check out their free trial, it has plenty of features to give you an ideas if the paid plan is worth it. It allows you to fully customize the player, making it fit your website/brand. It also makes it easy to embedd videos hosted on other platforms (such as Youtube, Vimeo, Wistia), while adding marketing features to the player. I have not yet used their storage, but it's great that they offer an alternative to other video sharing websites. "It's time to ditch YouTube as Vooplayer is all you need." Almost all the pro features which give us more than what we get on Youtube or Vimeo. Their support is superb and very responsive. The weekly Q&A helps you in marketing your videos plus most of the queries and the best advice is provided in their FB Group! Well, we wish if they provide more than 25GB storage, maybe at least 50GB plus some advanced features and integrations like email validator maybe as add-ons. We highly recommend vooPlayer to all the bootstrapped media companies like RTIwala. you want to host your videos on your website without the help of Youtube and Vimeo as former comes with annoying ads whereas late takes hell lot of time in buffering. Therefore its very important for us to use vooPlayer and it also helped us in capturing leads and payments for exclusive content. Vooplayer is well optimised and the playback is very fast than other similar platforms. there are a ton of tools available in vooplayer for you if you're a video marketer. the upload dashboard is really simple you just have to click on the upload button and select the file, it'll upload the file through FTP which is really fast. once uploaded there are a lot of options available for you to customize it, you can customize the player in different forms as you like and there are a lot of options to brand your video. with vooplayer it's very easy to host your private video and share it with your users. there are several marketing tools also available inside vooplayer, for example, you can lock the video playback and create a call to action or lead capture for marketing purposes. coming to analytics, it's not the best out there but its well detailed you can get the data which can be exported easily in CSV formats. Vooplayer is not cheap and isn't cheap, the monthly plan starts at $47 which can not be afforded by all the users. the analytics of the video platform should be improved. the FTP upload is fast but when uploading large files it tends to lag. this is a great marketing platform but its costly, i do not recommend it unless you could afford it. vooplayer is a video hosting and marketing platform where you can host your own videos and share it with your users. there are several marketing tools and customization available. "vooPlayer adds a ton of powerful features for video"
vooPlayer makes it easy to protect my embedded videos to ensure they load only on my whitelisted domains and makes them difficult to rip and redistribute. Plus their A/B testing and stats make it straightforward to see which videos convert better. Not much to dislike, they have generous bandwidth limits and an intuitive interface. I can more accurately track analytics, and split testing has allowed me to uncover which videos lead to higher retention and more sales. "Video Hosting that worked wonders for us"
I really like the analytics that come with the entire package because it helps us really dig deep. We are able to run reports that really helps us see what is being watched and what isn't. It is incredibly versatile as it allows for porting to any website that we have used. The best thing is the way it allows for a seamless transition from youtube to my site. It is not the best user interface to deal with as some of the folders are a little buggy to work with. I would recommend vooplayer for anyone who is looking for a easy transition of a youtube video right to their own site. It has helped out company look very professional and have gotten many compliments on it. This allows us to put our video on our site and make it look like we are hosting it on our own. It makes our site look so much more professional and has gained us clients simply because of it's looks. "Nice features for Video Marketing, tracking, statistics"
I like the customizable player, colors, watermark logo, Action gates (ask the viewer to enter their email address or phone number to keep watching). I have a AppSumo Pro plan and I see "You need to upgrade your plan to use this feature" all over the place, with big yellow signs. It's very enoying. I don't know if anyone will respond to this kind of aggressive upsale strategy? They promoted many features in the AppSumo Deal showing the Reporting features, where you can see the social profile of your viewers. But now it's only available for people who upgrade. Very deceiving to say the least. I think it's still an ok tool, but I don't like the business practices being applied here. Subtitles cannot be used with self-hosted videos, you need to host them with vooPlayer. So this makes the tool less usable for our business. study the different plans carefully, as you may be surprised that certain features are not included in your plan. We want to track how many people are viewing our videos, at what time they loose interest, what countries they are from, etc. so this is a good start to do that. "You'd Need At Least A Dozen Other Video Players To Get The Same Feature Set Found In VooPlayer"
I am saving a lot of money and the product is having all the features that I normally use and more all combined in one. So far, none. Easy to implement. Also, I am saving a lot of money and the product is having all the features that I normally use and much more all included into one dashboard. Getting to optin box, timers and call to action buttons or clickable Buy Now buttons is on of the greatest tools you can use on videos today and this put to use easily with vooplayer. You can test for conversion or engagement, plus call to actions and set vooPlayer to automatically show the winner. Vooplayer has helped me sell so much more with the video triggers like CTA and gate forms. Unbelievable the power of this thing! If you work with video and sales you should totally get it! It's a no brainer deal! There was a great improvement on the sales automation process.... doing VSL videos become much more great with this tool! "VooPlayer is worth playing with"
It's a very good platform if you need to upload and share your videos. You can use passwords to give permission to view. Your videos can not be downloaded by the viewers. There is nothing I can point as disadvantage. It's a very good one. Take it. The most useful for me is uploading videos and giving access to my customers. They can also be password protected and embed into site page. "Great video sharing & feedback "
Great service! Super fast, and reliable. The feedback is extremely helpful. There isn’t much to dislike. The service does exactly what it says it’ll do and far exceeded my expectations. I am able to upload business marketing videos, share them on other websites and get feedback from viewers. It’s great because the feedback helps us realize what we need to change and what we are doing right! I like that it is easily helpful with instructions and it's very discriptive with instructions. The prices it would be nice to have all the features and not have to pay for it. I'm making my YouTube channel and it's definitely helping me with making great videos I was not very tech savvy but this has definitely helped me. * We monitor all vooPlayer reviews to prevent fraudulent reviews and keep review quality high. We do not post reviews by company employees or direct competitors. Validated reviews require the user to submit a screenshot of the product containing their user ID, in order to verify a user is an actual user of the product. Hi there! Are you looking to implement a solution like vooPlayer?